Hanoi (VNA) – Vietnam shipped 749 million USD worth of seafood abroad in August, bringing seafood exports in the first eight months of 2017 to 5.13 billion USD, up 18.1 percent from the same period last year. 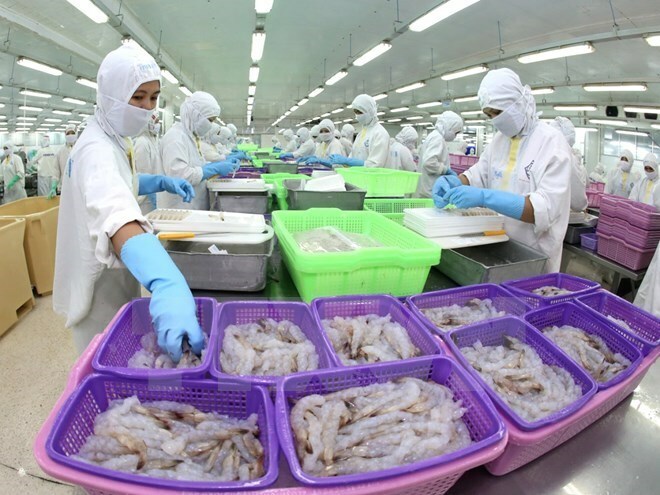 According to the Ministry of Agriculture and Rural Development, the largest buyers of Vietnamese seafood included the United States, Japan, China and the Republic of Korea, accounting for 55.6 percent of total exports. Export value to China showed the biggest increase of 57.2 percent, followed by Japan (30.8 percent), the United Kingdom (30.1 percent), the RoK (28.8 percent), the Netherlands (25.3 percent) and Canada (20.7 percent). Meanwhile, Vietnam imported 912 million USD worth of seafood in the first eight months, a year-on-year rise of 31.3 percent. In a move expected to hurt seafood exports, the US Department of Agriculture has just revealed it will begin inspecting all pangasius and Siluriformes fish imports from Vietnam from August 2, instead of September 1 as previously announced. However, no customs-related issues have been reported on export batches to the US since then. The pangasius has been fetching from 22,000 – 25,000 VND per kg in the Mekong Delta during August, depending on its quality and the payment method.